KEY CONCEPT: Division word problems. DESCRIPTION FROM THE PUBLISHER: After being banished to the Abyss of Zero in MULTIPLYING MENACE: THE REVENGE OF RUMPELSTILTSKIN, Rumpelstiltskin is back, and he’s stirring up more trouble than ever. Together with his sidekick, a witch named Matilda, Rumpelstiltskin plots his revenge on Peter and uses his magical powers to divide the kingdom into frogs. 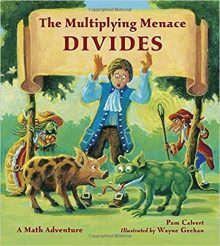 Peter and his dog, Zero, must locate the Great Multiplier and find a solution that will break the Great Divide before Rumpelstiltskin has a chance to combine the two mighty math sticks. Can Peter once again save the kingdom in time, or will it meet a green and warty fate?